The WIN-Gallup International “Religion and Atheism Index” collected data from 57 countries on the topics of religion and atheism in their latest report. More than 50,000 people participated in this survey. 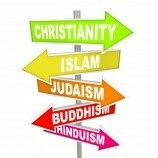 The Religiosity Index represents the percentage of the population who self-describe themselves as ‘a religious person.’ To define that they would pose a following question: Irrespective of whether you attend a place of worship or not, would you say you are a religious person, not a religious persons or a convinced atheist? 1. The poor are more religious than the rich. People in bottom income groups are 17% more religious than those in the top income groups. 2. 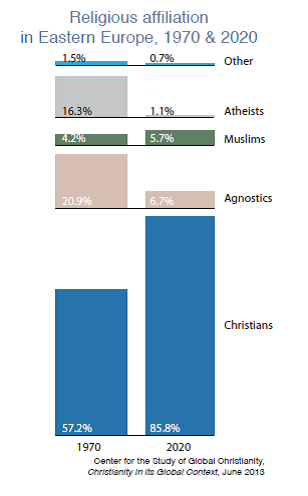 Globally, the number of those claiming to be religious has dropped by 9% from 2005 to 2011, while the number of people identifying themselves as atheists has risen by 3%. 3. Four countries have experienced a drop in religiosity in their populations that is greater than 20% between 2005 and 2012. France and Switzerland saw decreases of 21%, while Ireland’s number of faithful declined by 22% and Vietnam’s by 23%. When reading the latest survey done by Gordon Conwell, I was especially interested in Eastern Europe. Well, it seems that there is a hope for the ‘marginalized groups’ which are the evangelicals in the research language. Growth is expected at a rate of 1.2% annually. At the height of Communism in 1970, the region of Eastern Europe was only 57.2% Christian, the lowest percentage of any region in the global North for that time period. After the fall of the Soviet Union in 1991, droves of agnostics and atheists came into to the churches. By 2010, the region claimed 84.0% Christian adherence, similar to the situation in 1910 (89.6% Christian). Looking toward 2020, Christian gains are likely to be more modest, with a 0.02% average annual growth rate between 2010 and 2020. The whole document (92 pages) can be found at the following link of Center for the Study of Global Christianity.